Each Student massage is a great massage. And a wonderful way to add to their education. I'm happy to be a part of it. Loved my student Facial - I have gone twice now to celebrate birthdays with special friends and we were all so impressed with the quality and affordability. These girls are doing a very professional job, its so relaxing and my skin looked great afterwards. Its also so affordable that we will be back often. I highly recommend trying a student facial here. Just had my first student massage- it was awesome! My student massage therapist was well trained, professional and provided an amazing relaxation massage for less than 1/3 of the price of most 50 minute massages, so I guess I can go back more often. I highly recommend getting it a try, you wont regret it. My name is Laura, I am a student in the skin care program at Space Coast Education Center. I am graduating February 19, 2018. The best part of the program by far, was our teacher, Mrs. Benita. She is absolutely the most wonderful teacher I have ever had the honor of having teach me. She is a wealth of knowledge and one of the most caring teachers or people I have had the pleasure of knowing. She is always there for you and really wants to help you learn. She is truly happy to answer any questions you have and make sure you understand the answer. She has a big heart. I learned a lot from her and even though I will be graduating very soon, I know if I needed her, she will be there for me and my other class mates. I've seen it with her passed students also, who have stopped by to give her hugs and say hi. We all love her very much. Laura S.
SCEC is not only a great school providing an excellent program to become a well-rounded therapist/specialist. They strongly believe in community. For over 11 years, under the leadership of Jody Stork, the students volunteer offering the Candlelighters of Brevard families (children diagnosed with cancer and their families) a much needed relaxing massage. Their passion for giving back to the community is one of their strongest beliefs. COB thanks Jody, staff, and all their bright students for their time and talent throughout the years. Thank you to all students in massage training for your healing touch. It's so affordable, I book a student massage whenever I need stress relief! 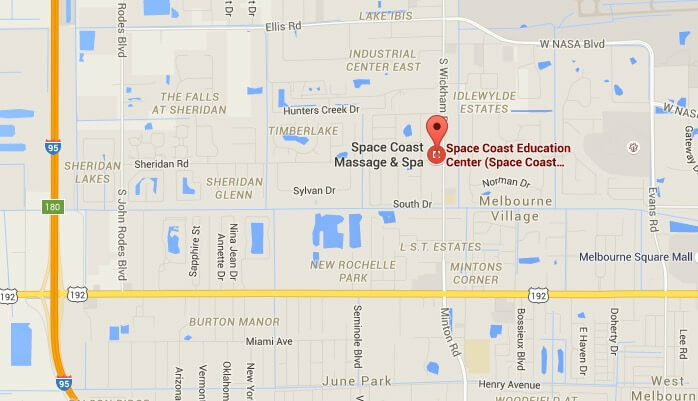 Space Coast Education Center is an awesome place to learn Massage Therapy. The 6 month program was intense! Lots of learning and growth! Excellent teachers! They really prepared you to pass your National Boards and readied you to enter the work force! At graduation, I had 3 job offers waiting for me! The field of Massage is growing! If your in a job full of stress, or just feel like doing something new, massage is awesome! The best school ever. The best and fastest 6 months. Excellent service. Have had numerous massages. Highly recommend. I can not say enough great stuff about Spacecoast Education Center, as a former graduate, they have amazing staff !! I still go there to get a student massage when I can, I have always been happy with my massage! Was the best decision of my life to attend this awesome school. Learned more than I bargained for and wouldn't change a thing!!!! Are you client or previous student? * Would you recommend us to your friends? * Where would you like to leave your review?